When I see tomatoes like this, pretty much all I can think about is finding some mozzarella. Fresh bread and baguettes return! As usual, we’ll have Talking Breads on Thursday, and McGrath’s Bakehouse on Friday and Saturday. Big price drops on sungold and mixed cherry tomatoes. 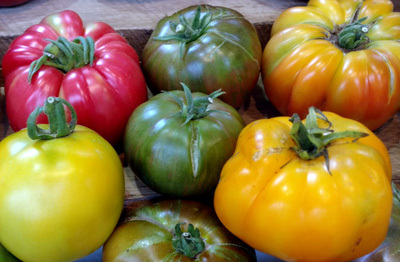 Smaller price drops on red tomatoes, eggplant, and cantaloupe. Bell peppers make their debut, albeit in small quantity, and this week’s plum tomatoes are San Marzanos. In the freezer (not on display) are two Caputo Bros Creamery products: CapoMozz, and Cagliata. Both can be turned into amazing mozzarella — read below for more on this. First off — thanks to everyone who cleaned the freezer of frozen bread last week! I mean, sort of. I didn’t think to snag a loaf for myself at the start of the weekend, and man did I miss it this week. I’ll be very happy to have it back in my life. But on a (mostly) unrelated note, since tomatoes are in full swing, Dusty and I are eating a *lot* of caprese salads. This is sort of what we live on through the summer, since it’s delicious, easy, and doesn’t require heating anything. We usually get fresh mozzarella balls from Hummer’s — enough to last the whole week — and sometimes panic when we run out. Except….the last time we made it, we did heat some water so we could use the Caputo Brothers Creamery CapoMozz product that has been sitting in our freezer waiting for tomatoes to come along. CapoMozz is a new product from Caputo Brothers (based in Spring Grove, PA, down between York and Gettysburg), which (I’m actually kind of sad to say) replaces their Cagliata. Both the CapoMozz and the Cagliata are frozen cheese curds, which through some heating and stretching (and maybe magic?) become fresh mozzarella. Maybe the best mozzarella you’ve ever eaten. We’ve got both in the freezer, for $11 each* (just ask). Videos from Caputo Brothers on how to work the magic are here for CapoMozz, and here for Cagliata (and here for more videos). The processes are very similar — with the CapoMozz, they’ve really just done some of the work for you ahead of time, and the packaging is shaped to thaw a little faster. The Cagliata is a more authentic process, and will yield a little more cheese. Caputo Brothers is making the only local mozzarella (okay, okay, technically fior di latte) I know of, but it’s even better than that — they’re using Apple Valley Creamery milk for all their cheeses, and they’re the only commercially-available mozzarella made in the whole country that is cultured, rather than acid set. And they’re right here in central PA. Here’s a good article about what they’re doing and why. In addition to making cheese, the Caputos offer culinary tours of Italy….but since that’s not in my immediate future, I’ll just spend my summer eating as much of the mozzarella as I can. *We’re getting these in small quantities through Apple Valley Creamery right now, and not really in their normal retail packaging. I hope we’ll start carrying it “for real” eventually, but I’m not sure what the actual price will be if we do. So for now, $11.